The new gameplay video of Homefront: The Revolution shows us that besides fighting in the Red Zone and the high security Yellow Zone you will need the countrymen on your side to ignite the uprising and free Occupied Philadelphia. Also new screenshots to highlight the before/after effects on the environments following your actions. Moreover, Deep Silver announces The Merits Program. 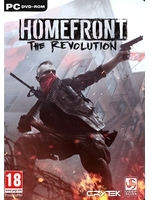 By registering at Homefront-Game.com you will be able to complete missions and discover more of the lore and eventually unlock the Red Rebel Combat Gear for your Resistance Mode co-op character. Larkspur, Calif., April 13, 2016  Deep Silver today unveiled the Homefront®: The Revolution Merits program, a reward plan for members of the Homefront community. 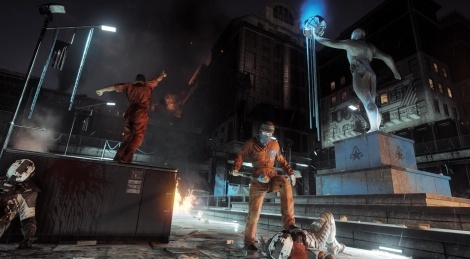 Anyone can simply go to Homefront-Game.com and begin earning Merits by completing missions on the site to dive deeper into the lore of the universe. Each Merit earned unlocks a corresponding piece of Combat Gear from the Red Rebel set, which can be used to customize your co-op character in Resistance Mode. Once merits are achieved, players will see the associated in-game Combat Gear unlock by linking their Homefront profile to their Xbox LIVE, PSN or Steam account. Seven merits are currently available at the launch of this program, with more to come between now and when Homefront: The Revolution launches on May 17 in North America. In addition, the new Hearts and Minds 101 featurette showcases how players can perform actions in the open world  the red, yellow, and green zones - in Homefront®: The Revolution, and earn the support of the oppressed population of occupied Philadelphia through unique gameplay mechanics. Through Hearts and Minds, the players actions have a direct effect on the world around them, with an ultimate goal: Ignite a Revolution. For more information and to get the latest updates on Homefront: The Revolution, visit the official website at www.Homefront-Game.com, follow us on Twitter and Instagram at @HomefrontGame or on Facebook at Facebook.com/HomefrontGame. The last game that had such a fraught development/publishing process that I followed was Sleeping Dogs which despite being rough in places was a brilliant game so I desperately hope the same applies here!